Three widths and numerous options allow these versatile secretary desk workstations to be used as a kitchen office or even a home office, perhaps with the help of the kitchen table for layout space. All of the Hi-tech office machines can be hidden away when not in use, perfect for the period style kitchen. Here, an unfitted C40-20D secretary desk is made of quartersawn white oak and stained in our Craftsman Oak color is shown at 40″W x 20″D x 84″ H . Other models are 32″and 36″ wide. The clam shell doors hide the worktop in this secretary desk concealing a laptop computer, while the doors underneath accommodate a combination printer/fax/copier and a file drawer. 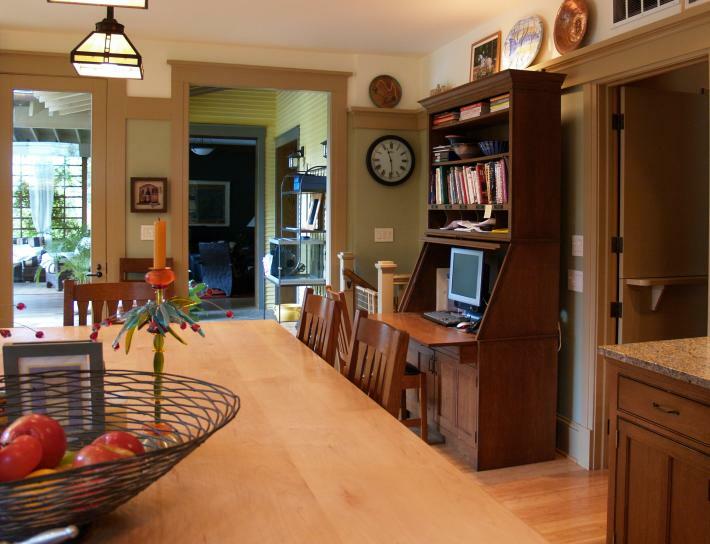 The shelving above handles all the cookbooks and features a mail slot for each member of the family. The upper shelves can have doors as well, or the unit is available without the upper shelving unit. 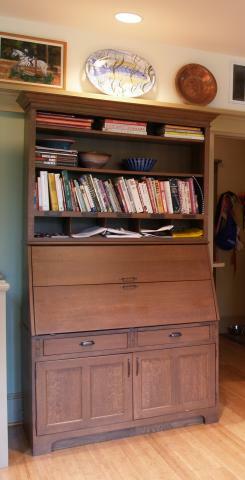 Here is another Secretary Desk in the form of a larger corner armoire/cupboard. The interior room in this workstation is immense and it too can hide all the technology a well equipped home office would need.